During this conference 15 selected case reports submitted to the Best Case Report Contest will be presented by the authors and discussed by experts recognized worldwide. The conference Clinical Cases in Internal Medicine: Learning Through Practice is funded per contract 886/P-DUN/2018 by the Minister of Science and Higher Education, dedicated to the dissemination of science. We advise you to check the schedule before registering. Rationale: ECG remains an essential investigation in acutely ill patients. Interpretation of ECG continues to be one of the basic skills expected from clinicians caring for such patients. Structured, careful, and fast but detailed, ECG analysis helps arriving at a correct diagnosis and improves patients’ care and outcomes. Learning objectives: This workshop is designed to build your knowledge, skills, and confidence in a step-by-step rapid interpretation of ECG. A case-based approach will be adopted in the discussion of the definition and differential diagnosis of narrow and wide QRS tachycardia as well as value of ECG in the setting of syncope, chest pain, shortness of breath, and atypical symptoms. We will also explore common tricks and traps of ECG interpretation. Rationale: Despite the introduction of various technological advancements in medical imaging, the chest x-ray remains the most frequently requested radiological investigation. Learning how to interpret a chest x-ray is among the most important and challenging skills to master in caring for patients. However, many practicing physicians find themselves ill-equipped to make confident chest x-ray interpretations. The interpretive process need not stir up negative emotions. With the proper grounding in knowledge, procedures, and principles, chest x-ray interpretation can be rewarding to the learner and, more importantly, can lead to accurate extraction of information, leading to better patient outcomes. Learning objectives: This workshop is designed to build your confidence in the interpretive process using a step-by-step algorithm. Participants will learn how to confidently distinguish between a normal and an abnormal chest x-ray and acquire specific interpretive skills that can be applied to daily practice. The workshop will also focus on practicing the newly acquired interpretive skills with numerous relevant clinical cases. Rationale: B-mode compression ultrasound (CUS) has become the diagnostic modality of choice for deep vein thrombosis (DVT). The 3-point CUS has high sensitivity and specificity for DVT. It allows for diagnosis at the point of care and decreased demand on radiology departmental services. Standard 3-point CUS includes examination of the upper femoral vein, lower femoral vein, and popliteal fossa. Basic ultrasound unit settings for CUS. Applied sonoanatomy of deep veins of lower extremities. No basic skills in ultrasound examination are required from participants. Rationale: Point-of-care ultrasound (PoCUS) is a limited ultrasound examination performed and interpreted by the clinician at the bedside or in the ambulatory setting to answer a focused clinical question or guide = performance of an invasive procedure. PoCUS is known to increase the accuracy of the physical examination. There is an increasing interest among clinicians in using PoCUS for diagnostic application but hands-on training opportunities continue to be limited. This workshop is an introduction to PoCUS with a focus on volume status assessment. Physical examination for volume status is usually inaccurate and jugular venous pressure examination has large inter-rater variability. This hands-on interactive workshop will introduce participants to the practice of using bedside ultrasound for volume status examination. It will cover lung ultrasound (lung sliding, A lines, B lines, pleural effusion), abdominal fluid, inferior vena cava measurement and interpretation, and volume responsiveness. Understand the basics of ultrasound technology and indications for PoCUS use. Appreciate how PoCUS can assist in answering focused clinical questions and augment bedside clinical care with a focus on volume status examination. Practice PoCUS to augment the physical examination for volume status assessment. Previous knowledge or experience with ultrasound is not required. Target audience: Rheumatologists, internists, trainees, sonographers, allied health professionals. Applied sonoanatomy of the small joints, ie, hand, wrist, ankle, and foot. This will allow greater precision in anatomical localization of a musculoskeletal diagnosis, including more accurate placement of joint injections. Basic skills required for ultrasound examination of the small joints of the hand, foot, wrist, and ankle. This will include a demonstration of the sonographic examination method followed by plenty of opportunities for hands-on practical examination. Common inflammatory and noninflammatory pathologies that affect small joints of the hands and feet. This will include identification of synovitis, erosions, tenosynovitis, and sonographic abnormalities of joints, tendons, and nerves. Conditions covered will include rheumatoid arthritis, psoriatic arthritis, and spondyloarthritis, as well as local conditions such as carpal tunnel syndrome, plantar fasciitis, and Achilles tendonitis. By the end of the course, attendees will have sufficient hands-on experience in scanning joints of the hands, wrists, ankles, and feet to take the first steps toward starting a musculoskeletal ultrasound service in their place of work. Rationale: Cardiac arrest is the most time-sensitive and demanding challenge faced by clinicians. In such scenarios, rapid assessment and life-saving treatments have to be implemented immediately. The goal of this cardiac arrest simulation (CAS) workshop is to equip participants with practical skills. The workshop provides a number of stations with simulations of acute clinical situations. Understand the concept of CAS training, including the concept of role-playing and the importance of nontechnical skills in resuscitation attempts. Understand the importance of teamwork and leadership in the management of cardiac arrest. Understand the treatment algorithms of shockable and nonshockable rhythms. Apply the current guidelines and skills taught in the workshop to practical management of the patient with cardiac arrest. Apply the skills, attitude, and knowledge required to function as a member of a resuscitation team. Apply the skills, attitude, and knowledge required to lead a resuscitation team. Understand the use of nontechnical skills in cardiac arrest teams. Securing the airway is frequently the most time-sensitive and anxiety-provoking challenge faced by clinicians. Although short, this is a highly intensive and hands-on workshop. It provides the opportunity to practice intubation using different laryngoscopy techniques. How to properly ventilate the patient using self-inflating bag-valve-mask ventilation technique. How to prepare the equipment for intubation. Indications and contraindications for intubation. How to safely intubate the patient using different laryngoscopy techniques. Securing the airway and proper ventilation is frequently the most time-sensitive and anxiety-provoking challenge faced by clinicians. Supraglottic airway devices (laryngeal mask, laryngeal tube, I-Gel®) are reasonable alternatives for those healthcare providers who do not perform tracheal intubation frequently enough to be skillful in that procedure. Although short, this is a highly intensive and hands-on workshop. It provides the opportunity to practice airway management and learn how to use supraglottic airway devices. How to prepare the equipment for securing the airway with the laryngeal mask, laryngeal tube, I-Gel®. Indications and contraindications for supraglottic airways. Possible complications of supraglottic airways. How to safely secure the airways using the laryngeal mask, laryngeal tube, < span>. Treatment of patients with life-threatening tachyarrhythmias poses a major challenge for the staff of intensive care units and hospital emergency departments. The workshop, run in high-fidelity simulation rooms that reconstruct conditions in the hospital ward, is designed to prepare doctors and students to perform electrocardiographic cardioversion procedures safely in both life-threatening and planned situations. Contraindications and possible complications of electrical cardioversion. How to perform procedural analgosedation before cardioversion. How to perform safe electrical cardioversion. Principles of patient monitoring after cardioversion. In some cases, administration of drugs to the patient is not possible. This may be due to the lack or occlusion of intravenous access and difficulties in establishing new intravenous access. In such situations, intraosseous access may be the only way to save your patient. It can be used to start both life-saving drugs and fluid therapy. The workshop aims to familiarize participants with the possibilities offered by modern intraosseous access systems and simple intraosseous needles. Indications and contraindications for intraosseous access. Possible complications of intraosseous access and their frequency. The equipment used to obtain intraosseous access (intraosseous needle, BIG®, Ez-IO®). The site for intraosseous access. How to establish intraosseous access using various types of equipment (intraosseous needle, BIG®, Ez-IO®). Rationale: Ability to critically appraise a randomized trial, which is central to the practice of EBM. Content: This workshop will use an example of recent RCT of general interest to illustrate the key elements of assessing risk of bias of randomized trials, understanding the results and applying the results to clinical practice. To learn how to assess risk of bias in randomized trials, including issues of concealment of randomization, blinding and loss to follow-up. To gain insight into how results of randomized trials are presented, including issues of relative effects, absolute effects and confidence intervals. To gain insight into issues of applying results of randomized trials in clinical practice including patients enrolled versus the patient before you, magnitude of benefits and harms and patient values and preferences. Rationale: Ability to critically appraise a systematic review, which is central to the practice of EBM. Content: This workshop will use an example of recent meta-analysis of general interest to illustrate the key elements of assessing the quality of a systematic review and the trustworthiness of the results it reports. To learn how to assess key elements of the quality of a systematic review, including question definition, search for evidence and summarization of evidence. To learn how to evaluate the credibility of the results presented in a systematic review, including issues of study design, risk of bias, precision, directness and publication bias. HIV infection: an emerging chronic disease? The end of evidence-based medicine? After a whole day of informative lectures please join us for a delicious dinner served in the cavernous brick hall of “Stara Zajezdnia” (The Old Depot), Kraków’s biggest brewery and beer hall situated in the heart of Kazimierz, the city’s historic Jewish district. The evening will feature a live musical performance by Jazz Band Ball Orchestra & Stanley Breckenridge, which will be followed by a live DJ set. Join us and dance to your heart’s content! Jazz Band Ball Orchestra (originally Jazz Band Ball) was formed in 1962 thanks to the late trumpeter Jan Kudyk and a group of students from the Academy of Music in Kraków, Poland. 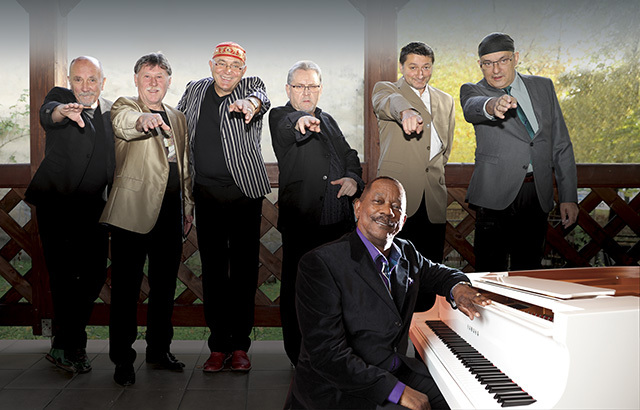 The band debuted in 1965 at the Jazz on the Odra Festival, the oldest jazz festival in Poland. Since then, it has performed a myriad of concerts all over the world, including the North Sea Jazz Festival in The Hague, Netherlands, Dixieland Meeting in Oberhausen, Germany, and the famous Dixieland Jazz Jubilee in Sacramento, USA. The band collaborated with an array of distinguished musicians, including the famous trumpeter Wallace Davenport. In Kraków, Jazz Band Ball Orchestra will perform with another famous musician, Stanley Breckenridge, a pianist and singer who holds a PhD in musicology. Breckenridge lectures at the Department of African American Studies at the California State University in Fullerton, USA, and in the past he also delivered lectures at Maria Curie-Skłodowska University in Lublin, Poland, and Jagiellonian University in Kraków, Poland. He has performed solo and with other musicians in a number of European countries, in Japan and in the USA. He released 9 albums. Stanley Breckenridge has been performing with Jazz Band Ball Orchestra since 2013. Tickets must be purchased separately (please refer to the Fees section). The performance is not financed by INFARMA member companies.